Reality is not as obvious and simple as we like to think. Some of the things that we accept as true at face value are notoriously wrong. Scientists and philosophers have made every effort to change our common perceptions of it. The 10 examples below will show you what I mean. Great glaciation is the theory of the final state that our universe is heading toward. The universe has a limited supply of energy. According to this theory, when that energy finally runs out, the universe will devolve into a frozen state. Heat energy produced by the motion of the particles, heat loss, a natural law of the universe, means that eventually this particle motion will slow down and, presumably, one day everything will stop. Solipsism is a philosophical theory, which asserts that nothing exists but the individual’s consciousness. 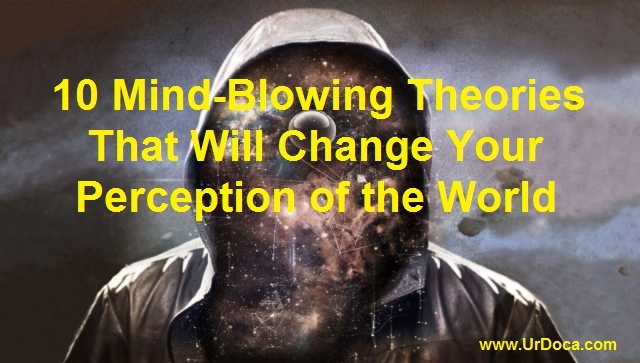 At first, it seems silly – and who generally got it into his head completely deny the existence of the world around us? Except when you put your mind to it, it really is impossible to verify anything but your own consciousness. Don’t you believe me? Think a moment and think of all the possible dreams that you have experienced in your life. Is it not possible that everything around you is nothing but an incredibly intricate dream? But we have people and things around us that we cannot doubt because we can hear, see, smell, taste and feel them, right? Yes, and no. People who take LSD, for example, say that they can touch the most convincing hallucinations, but we do not claim that their visions are “reality”. Your dreams simulate sensations as well, after all, what you perceive is what different sections of your brain tell you to. As a result, which parts of existence can we not doubt? None. Not the chicken we ate for dinner or the keyboard beneath our fingers. Each of us can only be sure in his own thoughts. The idea being that if the stone really only exists in his imagination, he could not have kicked it with his eyes closed. Refutation of Berkeley is hard to understand, especially in these days. He argued that there is an omnipotent and omnipresent God, who sees all and all at once. Realistic, or not? reality illusionEverybody has heard of Plato. He is the world’s most famous philosopher. Like all philosophers, he had a few things to say about reality. He argued that beyond our perceived reality there lies a world of “perfect” forms. Everything that we see is just a shade, an imitation of how things truly are. He argued that by studying philosophy, we have a chance of catching a glimpse of how things truly are, of discovering the perfect forms of everything we perceive. In addition to this stunning statement, Plato, being a monist, said that everything is made of a single substance. Which means (according to him) that diamonds, gold and dog feces all consist of the same basic material, but in a different form, which, with science’s discovery of atoms and molecules, has been proven true to an extent. Time is something that we perceive as a matter, of course, if we view it at the moment, we usually divide it into past, present and future. Presentism argues that the past and the future are imagined concepts, while only the present is real. In other words, today’s breakfast and every word of this article will cease to exist after you have read it, until you open it again. The future is just as imaginary because time cannot exist before and after it happened, as claimed by St. Augustine. Eternalism is the exact opposite of presentism. This is a philosophical theory that says that time is multi-layered. It can be compared to a pound cake (however, unlike the time, a biscuit is not up for philosophical debate). All time exists simultaneously, but the measurement is determined by the observer. What he sees depends on which point he is looking at. Thus, dinosaurs, World War II and Justin Bieber all exist simultaneously but can only be observed from a specific location. If one takes this view of reality then the future is hopeless and the deterministic free will is illusory. The “brain in a jar” thought experiment is a question discussed by thinkers and scientists, who, like most people, believe that human’s understanding of reality depends solely on his subjective feelings. So, what is the debate? Imagine that you are just a brain in a jar that is run by aliens or mad scientists. How would you know? And can you truly deny the possibility that this is your reality? Anyone who has not spent the last ten years on a desert island has at least once heard of “the multiverse”, or parallel universes. As many of us have seen, parallel words, in theory, are worlds very similar to ours, with little (or in some cases, large) changes or differences. The multiverse theory speculates that there could exist an infinite number of these alternate realities. What’s the point? In a parallel reality, you have already killed the dinosaurs, and you are lying under the ground at a depth of eight feet (because that’s what happened there.) In the other you might be a powerful dictator. In another, you might never have even been born since your parents never met. Now that’s a memorable image. This is the most fascinating branch of multiverse theory. Superman is real. Yes, some of you would probably choose a different story, for argument’s sake, Harry Potter might be real too. This branch of the theory argues that given an infinite number of universes, everything must exist somewhere. So, all of our favorite fiction and fantasy may be descriptive of an alternate universe, one where all the right pieces came into place to make it happen. Everyone is interested in what happens to things when we aren’t looking at them. Scientists have carefully studied this problem and some of them came to a simple conclusion – they disappear. Well, not quite like this. Phenomenalist philosophers believe that objects only exist as a phenomenon of consciousness. So, your laptop is only here while you are aware of, and believe in its existence, but when you turn away from it, it ceases to exist until you or someone else interacts with it. There is no existence without perception. This is the root of phenomenalism. This post was republished from listverse.com. You can find the original post here.